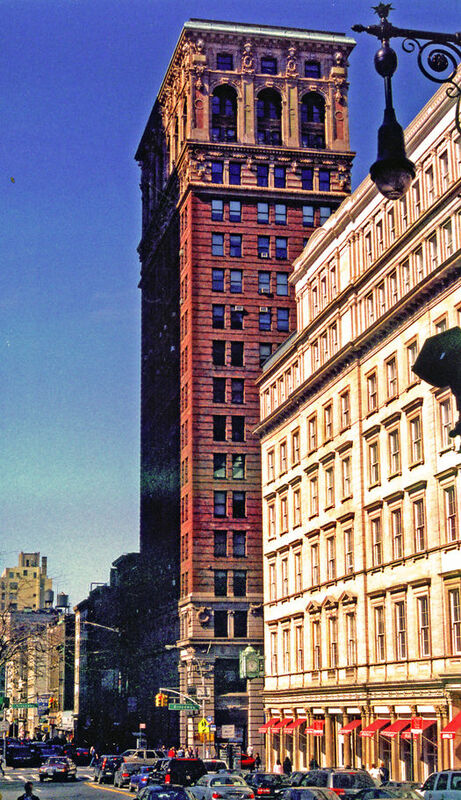 The design of the Broadway Chambers Building is derived from Classical architecture. The arrangement of the column—base, shaft, and capital—are translated into building parts. 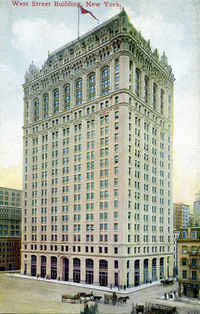 Here, the tripartite arrangement features a three-story base faced with granite, a fifteen-story shaft of red brick, and a four-story cap of terra cotta. 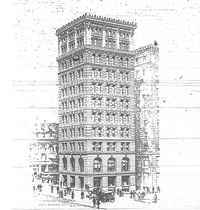 Gilbert's original plan had called for a terra cotta building with a marble base. The building's initial, striking feature is its strong and contrasting colors. Gilbert began experimenting with color in the Gotzian Building (1895). For over two years, Gilbert worked to create interest for the project he had in mind at the corner of Broadway and Chambers. It all came together early in 1899 when Harry S. Black of the Fuller Company of Chicago and investor Edward R. Andrews of Boston agreed to build the Gilbert design. The Scottish Provident Institution of London was the mortgagee. Complicating the project was the fear that new zoning laws would limit the height of the building, so everyone involved felt the need to hurry. Then, soon after construction began, arose a possibility of acquiring adjacent real estate and erecting a larger building on the site. The zoning laws did not change, the land acquisition fell through, and the building was built to the original design. The building was a great success before it was even finished. Gilbert, claiming it would attract tenants, hired Hughson Hawley (who had worked on the Minnesota and Montana capitol projects) to do the rendering. Gilbert exhibited it at the Architectural League of New York's annual exhibition. Fuller exhibited the building at the Paris Exposition of 1900—included were two eleven-foot models: one, in steel, of the frame, the other, finished. The exhibit also included full-scale models of some of the building's parts. The exhibit was popular with architects and the public, and it won five awards, including a Grand Prize for the Fuller Company. Gilbert won two awards as a collaborator, but the design was never entered in the architectural competition.